This book consists of two interconnected parts. 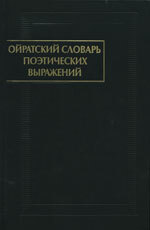 Firstly, it is a publication of a unique Oirat manuscript from the collection kept at the Institute of Oriental Manuscripts, Russian Academy of Sciences (St. Petersburg). Its author is a prominent Oirat scholar and translator Zaya-pandita Namkhaidzhamco (the 17th century). The manuscript is a fine example of a vocabulary which consists of lists of poetical expressions (or epithets) giving definitions of about eighty referents—among them Buddha, Bodhisattvas, mythological characters, natural phenomena, plants and animals. No other vocabularies of this kind are known in Mongolian languages, though this literary tradition was well developed in India and Tibet. The most outstanding is Amarakosha lexicon written in Sanskrit, while several its translations and original vocabularies are known in Tibetan. A Tibetan-Mongolian dictionary by Sumatiratna (late 19th century) includes a good many of such poetical names. The Oirat vocabulary is undoubtedly a translation from the Tibetan language, most likely based on several sources. Secondly, it is the vocabulary itself. On the basis of the Oirat text and corresponding Sanskrit and Tibetan sources, an Oirat-Tibetan-Sanskrit dictionary of epithets was compiled with the addition of Mongolian equivalents. It shows that, on the one hand, the Oirat and Mongolian names have a distinctive connection to the Sanskrit ones, but on the other hand, in many cases the links were lost or unrecognizably transformed in the course of the two-phase translation. The main reasons for these transformations or mistakes were word-for-word translations often based on popular etymology, a strong foreign cultural influence (including, e.g., names of mythological characters), the choice of the wrong meanings of a word, misreadings or mishearings of similarly written or pronounced words. When combined, these reasons led to the appearance in the Oirat text of translations which were rather far from their Sanskrit originals. On March 4, 2019, at the meeting of the Academic Council of the IOM RAS, senior researcher Dr. K.G. Maranjian will submit her lecture New Acquisition in the Japanese Collection.